We define a boutique Software-as-a-Service (SaaS) as a business from one to fifty people, which primarily sells a software product through an online subscription service. We were curious to find out the technology stacks behind those businesses, as well as the usage of administrative features (User profiles, Billing, etc.) that need to be built up as part of running a Software-as-a-Service but which are not core to the service delivered. The technology stack of a wide variety of boutique SaaS businesses. How much users interact with the administrative features of a Software-as-a-Service product (User profiles, Billing, etc.) vs. the actual product being delivered. We analyzed the technology stack of 38 businesses with 1-10 people and 53 businesses with 11-50 people delivering a software product as a subscription service. We used BuiltWith to retrieve information about a site technology stack. We also used the Google Developers tools to retrieve HTTP headers when necessary to decide what technology is used. When this wasn't enough, we relied on job postings and other outside communication from the company. Sometimes static home pages or pricing pages are served by other means than the technologies used to implement the Software-as-a-Service business logic. So we did all the analysis on a registration or login page as these are the most likely candidate for the actual framework used. Nginx makes up for the overwhelmingly majority of front-end proxy web servers (68%). Apache is second with a total of 16% across the board. We can find Cowboy, Express, IIS, markers for Google AppEngine and sometimes gunicorn directly. 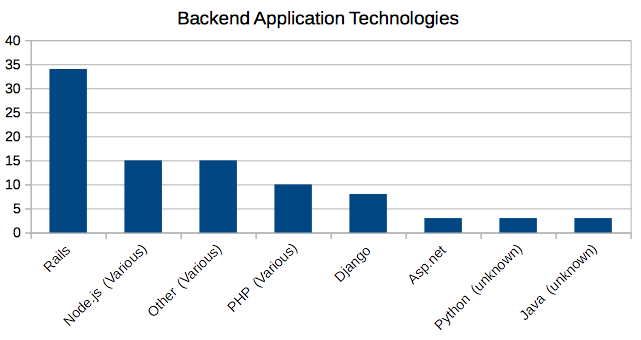 Outside of Rails that represents around 40% of the backend application framework used, the set of application framework and programming languages used on the server is widely fragmented, each taking a few percentage points. This is often a reflection of the CTO's experience. There are great posts on website's requests from a browser perspective and Optimizing for rendering speed. Here we are interested to analyze what happens server-side to a request hitting an application hosted on DjaoDjin. DjaoDjin's infrastructure is built of a generic HTTP server, a session manager proxy and customer web applications. Typically requests for static content are completed by the generic HTTP server (nginx in our case). Other requests are forwarded to the session manager. All pages and APIs that deal with the administrative part of a Software-as-a-Service (ex: /login/, /billing/, etc.) are completed there. Other requests given a green light by the subscription firewall are forwarded to a customer application. Thus DjaoDjin's customers need only implement a micro-service for the business logic actually delivered to end users. From earlier measurements of DjaoDjin customers code bases, we found out that 80% of a boutique Software-as-a-Service product deals with the administrative component of running a business online. That means 80% of the code base deals with less than 33% of the total requests a site handles every day. Regardless that code, which deals among other things checkout and credit card updates, is critical to run a business on the Internet. 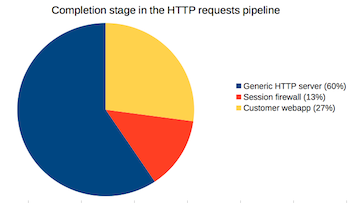 "80% of a Software-as-a-Service code base deals with less than 33% of the total HTTP requests. Yet those features are must-haves." When we started DjaoDjin we knew we were solving a big pain point. We strive to be good citizen to the community and opened source all pieces of DjaoDjin Software-as-a-Service infrastructure from the first day (djaodjin-multitier, djaodjin-pages, djaodjin-saas, djaodjin-signup, etc.). Today with enough customers to have statically significant results, it is good to be able to share real numbers. We are looking forward to post about the struggles boutique SaaS have around subscription engineering (Plan upgrade, Charging overages, Chargebacks, etc.). If you have any stories to share, please write us a quick e-mail and let's start the conversation. Thank you.